Indonesia's incumbent presidential candidate addresses to supporters during a campaign rally at Gelora Bung Karno stadium in Jakarta, Indonesia, April 13, 2019 in this photo taken by Antara Foto. FILE - Indonesia's presidential candidate Prabowo Subianto speaks during a campaign rally with his running mate Sandiaga Uno at Gelora Bung Karno Main Stadium in Jakarta, Indonesia, April 7, 2019. 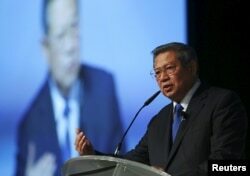 FILE - Former Indonesian president Susilo Bambang Yudhoyono delivers a speech in Singapore.